A VSU student is facing charges for possession of marijuana after an arrest late Aug. 21. 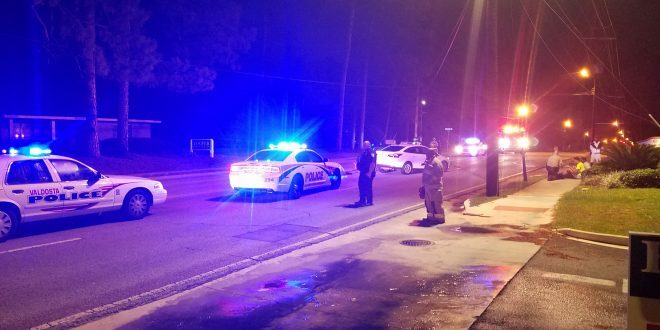 UPD Officer Caleb Lee arrested Demetrius Tharpe, 18, during a routine patrol which found the student allegedly smoking near Georgia Residence Hall. According to the police report, Lee began driving towards Georgia Avenue with the windows down. It was then that he reports smelling marijuana coming from a wooded area by Georgia Residence Hall and proceeded to investigate on foot. Soon after, Lee called two other officers for an on-scene assist. The officers approached Tharpe, who stood still immediately placing his hands in the air and allegedly admitted he was smoking marijuana alone, as stated in the police report. Lee and Officer Jeffrey Eltzroth placed Tharpe onto the ground, put him in handcuffs and began searching his person. “I recovered a clear plastic bag that had a green leafy substance resembling marijuana in it,” Lee said. Tharpe was then taken to the Lowndes County Jail where he was issued a citation for possession of marijuana less than one ounce.